196 Beacon is located on the north side of Beacon, between Clarendon and Dartmouth, with 194 Beacon to the east and 198 Beacon to the west. 196 Beacon was built ca. 1863 for George Bruce Upton, Jr., and his wife, Geraldine Ipolite (Russell) Rivers Upton, on land George Upton, Jr., purchased on June 13, 1862, from the Boston and Roxbury Mill Corporation. They previously had lived on Chestnut Street. Click here for an index to the deeds for 196 Beacon. George Upton was associated with his father’s businesses, which included ship building and ownership, real estate, and railroad interests. 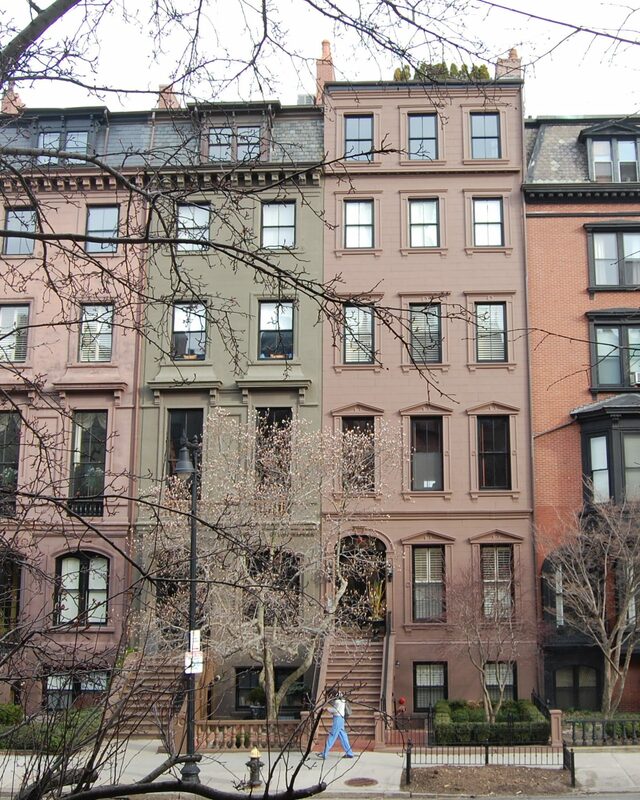 The Uptons continued to live at 196 Beacon in 1865, but moved thereafter to 5 Boylston. In 1872, they moved to a new home they had built at 19 Marlborough. On October 11, 1865, 196 Beacon was purchased from George Upton, Jr., by Israel Whitney. He and his wife, Mary Hopkins (Flagg) Whitney, made it their home. They previously had lived at 14 Temple Place. They also maintained a home in Beverly. Israel Whitney began his career as a shipmaster and supercargo in the East India trade. He subsequently became a shipping merchant in Boston in partnership with Thaddeus Nichols. He later became treasurer of the Lowell Manufacturing Corporation (carpet manufacturers), and was a cotton buyer for the New England factories, residing part-time in New Orleans. Israel Whitney died in November of 1871, and Mary Whitney died in August of 1872. On March 25, 1874, 196 Beacon was acquired from Israel Whitney’s estate by Sarah M. (Thatcher) Graves, the wife of Thomas Eugene Graves, an attorney. They previously had lived 206 Beacon and before that in West Newton. Thomas and Sarah Graves’s sons, Frank Herbert Graves and Eugene Emmons Graves, lived with them. Frank Graves was a lawyer in partnership with his father. E. Emmons Graves was associated with the Old Colony Railroad; he had served in the Union Army during the Civil War, mustered out as a brevet Lt. Colonel. The Graves’s third son, Thomas Thatcher Graves, also had served in the Union Army as aide-de-camp to General Weitzel and wrote a much-quoted essay on President Lincoln’s entry into the defeated city of Richmond. He was a physician and, in the 1890s, was accused and convicted of murdering a former patient by giving her a bottle of whisky laced with arsenic while she was on vacation in Denver. The Colorado Supreme Court reversed the conviction and ordered a new trial, but he committed suicide in prison before the new trial was held. Thomas and Sarah Graves continued to live at 196 Beacon in 1875, but by 1876 had moved to Thompson, Connecticut. On October 29, 1875, 196 Beacon was purchased from Sarah Graves by Joseph Dexter Bates. He and his wife, Adaline A. (Day) Bates, lived in Killingly, Connecticut, where he was a U. S. Marshall. 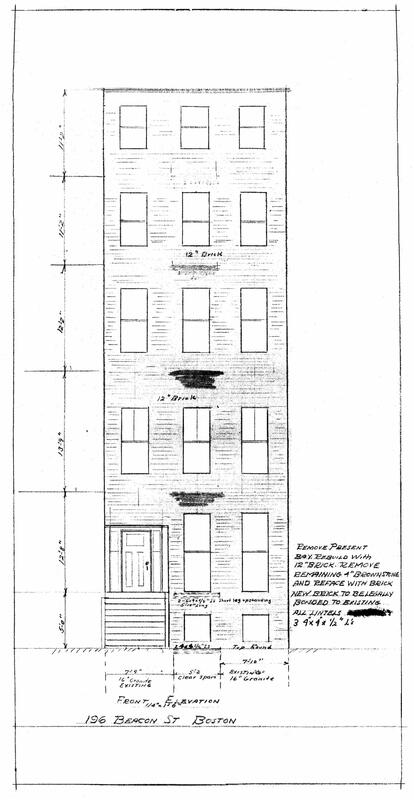 196 Beacon was not listed in the 1877 Blue Book, and was shown as vacant in the 1878 Blue Book. On June 4, 1877, 196 Beacon was purchased from Joseph Bates by Susan Elizabeth (Lawrence) Tucker, wife of dry goods commission merchant William Warren Tucker. They lived at 98 Beacon. She leased 196 Beacon to others. By the 1878-1879 winter season, 196 Beacon was the home of Andrew Varick Stout Anthony and his wife, Mary Aurelia (Walker) Warner Anthony. They previously had lived at 100 Mt. Vernon. Andrew V. S. Anthony was a noted illustrator and wood engraver. From 1866 to 1889, he supervised the fine arts editions published by Ticknor and Fields and its successors, Fields, Osgood and Co., and James R. Osgood and Company. 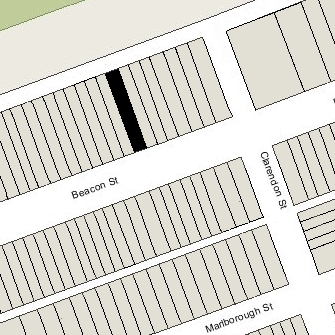 At the time of the 1880 US Census, publisher James R. Osgood was living at 196 Beacon as a boarder with the Anthonys. The Anthonys continued to live there during the 1882-1883 winter season, and probably until about the time of the marriage of their daughter, Helen, to Dr. Henry Phelps Perkins, Jr., in October of 1883. After their marriage, Henry and Helen Perkins lived in Lowell and then in Newton. Their son, James Osgood Ripley Perkins, became an actor on Broadway (notably in The Front Page in 1928) and in silent and talking films (his last appearance before his death in September of 1937 was an uncredited role in A Star is Born); his son, Anthony Perkins, was featured in numerous films, including Alfred Hitchcock’s Pyscho (1960). 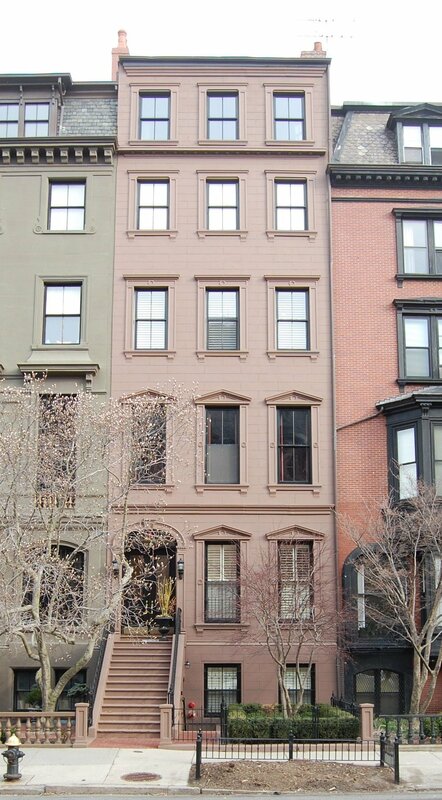 By 1884, the Anthonys were living at 30 St. James. 196 Beacon was not listed in the 1884 Blue Book. During the 1884-1885 winter season, 196 Beacon was the home of investment banker George Cabot Lee and his wife, Caroline Watts (Haskell) Lee. They previously had lived at 168 Beacon. They also maintained a home in Chestnut Hill. They had moved to 96 Beacon by the 1885-1886 season, and to 264 Beacon by the season after that. 196 Beacon was not listed in the 1886 Blue Book. During the 1886-1887 winter season, 196 Beacon was the home of attorney Causten Browne and his wife, Katharine Eveleth (Maynadier) Browne. They previously had lived at 19 Marlborough. By 1888, they had moved to 139 Beacon. 196 Beacon was not listed in the 1888 Blue Book. By 1889, it was the home of Mrs. Abigail S. (Gay) Kimball, the widow of carriage maker Theodore T. Kimball. She continued to live there until shortly before her death in July of 1889. On October 1, 1890, 196 Beacon was purchased from Susan Tucker by Helen Goodell (Farnsworth) Means, the wife of James Means. They previously had lived at 287 Marlborough. James and Helen Means’ sons, James Howard Means and Philip Ainsworth Means, lived with them. James Howard Means married in January of 1915 to Marian Jeffries, and they moved to her family home at 15 Chestnut. He was a physician and medical researcher, and later became chief of medical services at Massachusetts General Hospital. Philip Means became a noted archeologist and historian, specializing in ancient South American civilizations. James Means died in December of 1920 and Helen Means died in June of 1921. 196 Beacon was not listed in the 1922 Blue Book. On June 22, 1922, 196 Beacon was purchased from Helen Means’s estate by Margaret Theresa (Eskridge) Boos, the wife of Dr. William Frederick Boos. They previously had lived at 13 West Cedar. William Boos was a biological chemist and physician specializing in internal medicine, and maintained his medical office at 196 Beacon. He was a noted toxicologist and provided expert testimony in criminal cases. In September of 1922, Margaret Boos applied for (and subsequently received) permission to construct a two car garage at the rear of the property. 196 Beacon (ca. 1998); courtesy of Payne Collins Design, Inc.
William and Margaret Boos continued to live there until about 1935, but had moved to an apartment at 224 Marlborough by 1935..
196 Beacon was shown as vacant in the 1936 City Directory. On September 19, 1936, the Franklin Savings Bank foreclosed on its mortgage to William and Margaret Boos and took position of the property. In January of 1936, the bank applied for (and subsequently received) permission to remodel the house into six apartments, including removing the front bay and brownstone façade and replacing it with a simple brick façade. Plans for the remodeling, prepared for real estate dealer Overton W. Oglivie by John J. Mahoney, civil engineer, are included in the City of Boston Blueprints Collection in the Boston Public Library’s Arts Department (reference BIN P-133). The property subsequently changed hands, and on March 10, 1947, was acquired by Bryant Bigelow (born Frank Bryant Bigelow), who lived in one of the apartments. He previously had lived at 40 Peterborough. On June 1, 1949, 196 Beacon was acquired from Bryant Bigelow by Miss Dorothy F. Armington, a translator with the Christian Science Publication Society, who lived in one of the apartments. She previously had lived at 61 Park Drive. In November of 1952, she applied for (and subsequently received) permission to remove the rear wall of the existing garage, increasing its capacity from two to four cars. Architect’s rendering of renovated front elevation of 196 Beacon (ca. 1999); courtesy of Payne Collins Design, Inc.
Dorothy Armington continued to live at 196 Beacon until her death in December of 1988. In August of 1989, her estate applied for permission to increase the number of units from six to nine. The application subsequently was abandoned. On October 10, 1991, 196 Beacon was acquired from Dorothy Armington’s estate by the Brantam Corporation (Branka Milosevic, president and treasurer). In July of 1998, Brantam Corporation filed for (and subsequently received) permission to reduce the number of units to five, reflecting prior remodeling and consolidation of two apartments. On August 25, 1998, 196 Beacon was acquired from the Brantam Corporation by the Lyric Realty LLC (Shipley C. Mason, manager of record). On April 28, 1999, 196 Beacon was purchased from the Lyric Realty LLC by the Riverside Beacon LLC (Jeffrey A. Leerink, manager of record). On December 22, 1999, Riverside Beacon LLC converted the property into four condominium units, the Riverside Beacon Condominium. On August 31, 2000, Riverside Beacon LLC filed an amended master deed reducing the number of units from four to three.